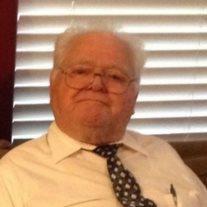 J. Walter Shumway, 85, of Mesa, Arizona passed away at home on March 15, 2014. Walter was born in Woodruff, Arizona in 1928. He was the second of 18 born to Charles and Belle Shumway. After serving for 20 years in the Air Force, he brought his family back to Arizona, and then worked another 20 years for the US Postal Service. He was an avid hunter and fisherman, a tinkerer, a fixer, a handyman, a collector, and a go-to man for many people who loved and respected him. Walter is preceded in death by his parents, and his wife, Eva Goodman Shumway, as well as 8 siblings. He is survived by his children Lynnette Stewart, Chuck, Jeriann Keeling, Phil, Becky Hansen, and Sharon McPeek, as well as 24 grandchildren and 20 great-grandchildren. Visitation will be Friday, March 21, 2014 at 9:30 AM, with funeral services at 11 AM, at the LDS Salt River Stake Center, 6942 E. Brown Rd., Mesa, AZ. Arrangements by Bunker’s Garden Chapel.